Stress has been categorized as an antecedent or stimulus, as a consequence or response, and as an interaction. It has been studied from many different frameworks. For example, Selye  proposed a physiological assessment that supports considering the association between stress and illness. Conversely, Lazarus and Folkman  advocated a psychological view in which stress is "a particular relationship between the person and the environment that is appraised by the person as taxing or exceeding his or her resources and endangering his or her wellbeing." Most people can cope with stress for short periods but Chronic stress produces prolonged changes in the physiological state. The issues of job stress, coping, and burnout among nurses are of universal concern to all managers and administrators in the area of health care. All these stresses can be modified in a positive way by the use of appropriate stress management skills. Thus, this study aimed at finding out (1) the degree of professional stress among the staff nurses and (2) various determinants, which have an impact on it so that strategies to improve their personal and professional quality of life can be planned out in the long run. It is an Institutional-based cross-sectional study, conducted in the year 2013-2014. Place of the study is Swami Vivekanand Hospital, attached to Subharti Medical College, Meerut. It is a tertiary hospital. 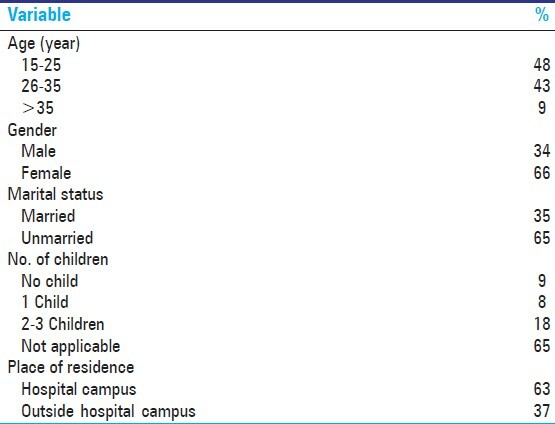 Study population comprised of nursing staff working in the hospital. Study unit included in the study was the GNM qualified nurse. 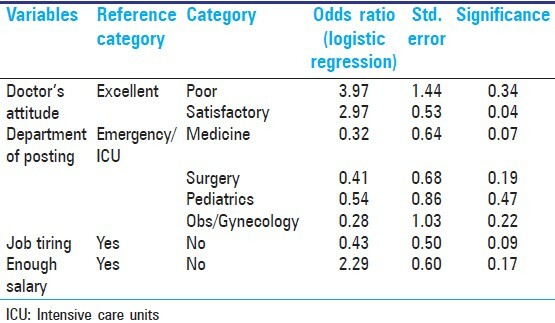 All the GNM qualified nurses working in the day or night shift were covered by consequential sampling technique; and all those who were on leave or not available at the time of data collection twice were excluded from the study. Thus, the total sample size of the study comprised of 100 staff nurses. Part I: Covering their sociodemographic variables and variables on their working environment, including attitude of the different category of working staff, salary, job condition, and so on. 46-60: Stress is a major problem and something must be done. Quality Assurances of the data collection: Data were collected by the well-trained and well-qualified two primary investigators themselves. It is important that stress is a state, not an illness, which may be experienced as a result of an exposure to wide range of work demands and in turn can contribute to an equally wide range of outcomes,  which may concern the employees' health and be an illness or an injury or changes in his/her behavior and lifestyle. In our study, 91% staff nurses were younger than 35 years with a mean age of 27.41 years (SD = 7.06), 34% were male nurses. One third staff nurses were married and out of them 18% had 2 or 3 children. 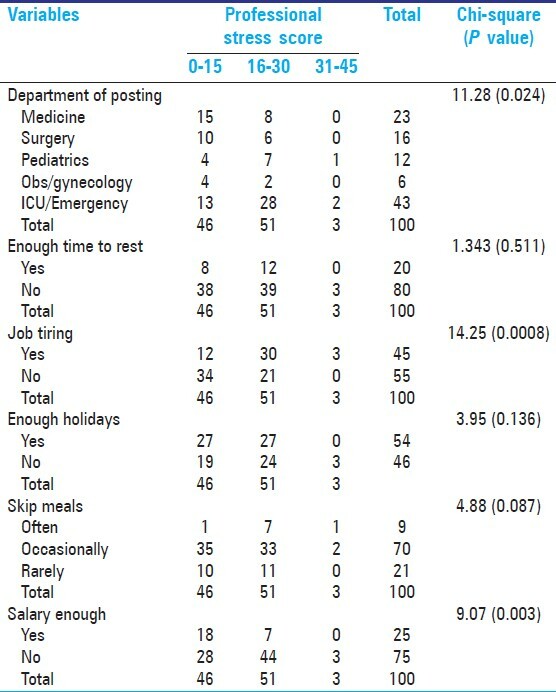 Work life, however, is not independent from family life; these domains may even be in conflict [Table 1]. 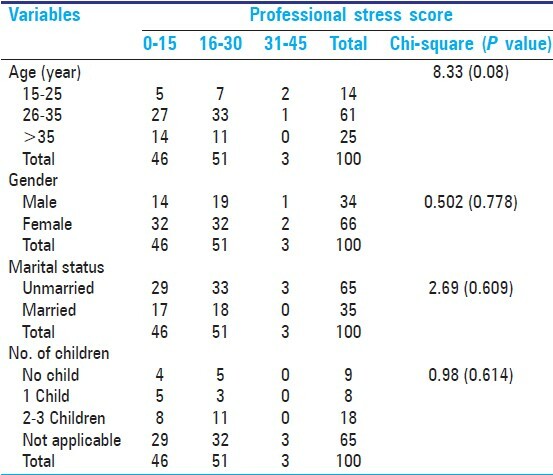 , In our study professional stress was not significantly associated with socio-demographic factors like age, marital status, no of children and gender of the staff nurse [Table 2]. Verbal abuse from physicians was noted to be stressful for staff nurses. Similarly, Adib-Hajbaghery and colleagues found that poor relationships between nurses and other health care professionals is a major source of occupational stress among hospital nurses. French and colleagues  identified conflict with physicians, problems with peers and supervisors, and discrimination as stressors for nurses. Thus, developing good personal relationship at work place is necessary for the prevention of job stress among hospital nurses. 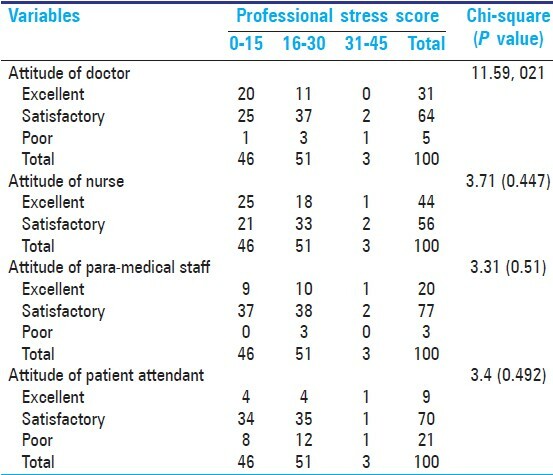 The level of occupational stress among a group of Indian staff nurses was measured using a questionnaire survey and professional stress scale and GHQ were applied. In addition, factors contributing to occupational stress were examined. Hospital nurses in this study reported moderate (51%) to severe (3%) levels of job-related stress. The main nurses' occupational stressors were poor doctor's attitude, posting in busy departments (emergency/ICU), inadequate pay, too much work, time pressure, and tiring job with insufficient time for rest and meals. Stress decreases attention, concentration, and decision making, and judgment skills. Occupational stress is also negatively related to quality of care due to loss of compassion for patients and increased incidences of mistakes and practice errors. Thus, hospital managers should initiate strategies to reduce the amount of occupational stress among the nurses. They should provide more support to the nurses to deal with the stress. Burbeck R, Coomber S, Robinson SM, Todd C. Occupational stress in consultants in accident and emergency medicine: A national survey of levels of stress at work. Emerg Med J 2002;19:234-8. Xianyu Y, Lambert VA. Investigation of the relationships among workplace stressors, ways of coping, and the mental health of Chinese head nurses. Nurs Health Sci 2006;8:147-55. Lee JK. Job stress, coping and health perceptions of Hong Kong primary care nurses. Int J Nurs Pract 2003;9:86-91. Marshall J. Stress amongst nurses. In: Cooper CL, Marshall, editors. White Collar and Professional Stress. London, Chicester: Wiley: 1980. Bailey RD. Coping with stress in caring. Oxford: Blackwell; 1985. Price JL, Mueller CW. Professional turnover: The case for nurses. New York: New Medical and Scientific Books; 1981. Cronin-Stubbs D, Brophy EB. Burnout: Can social support save the psychiatric nurses? J Psychosoc Nurs Mental Health Serv 1985;23:8-13. Selye H. The stress of life. New York: McGraw Hill; 1956. French JR, Caplan RD. Organizational stress and individual strain. In: Marrow AJ, editor. The failure of success. New York: AMACOM; 1972. p. 30-66. Caplan RD, Cobb S, French JR, John RP, Harrison RV, Pinneau SR Jr. Job demands and worker health: Main effects and occupational differences. Ann Arbor, MI: Institute for Social Research; 1980. House JS. Work stress and social support. Reading, MA: Addison-Wesley; 1981. Pelletier KR. Healthy people in unhealthy places. New York: Delacorte Press; 1984. Menzies IE. Nurses under stress. Internatl Nurs Rev 1960;7:9-16. Jennings BM. Stressors of critical care nursing. In: Thelan LA, Davie JK, Urden LD, et al., editors. Critical care nursing Diagnosis and management. St Louis, MO: Mosby; 1994. p. 75-84. Jennings BM. Turbulence. In: Hughes R, editor. Advances in patient safety and quality: An evidence-based handbook for nurses. Rockville, MD: AHRQ; 2007. p. 2-193-2-202. Chang EC, Tugade MM, Asakawa K. Stress and coping among Asian Americans: Lazarus and Folkman's model and beyond. In: Wong PT, Wong LC, editors. Handbook of multicultural perspectives on stress and coping. Dordrecht: Kluwer Academic Publishers; 2006. Tehrani N, Ayling L. Work-related stress. CIPD Stress at work, June 2009. Available from: http://www.cipd.co.uk/subjects/health/stress/stress.htm. [Lat accessed on 2008 Jan 12]. Cooper CL, Cooper RD, Eaker LH. Living with stress. Harmonsworth: Penguin; 1988. Health and safety executive. Tackling work related stress: A managers' guide to improving and maintaining employee health and well-being. Sudbury: HSE Books; 2001. Doherty N, Tyson S. Mental well-being in the workplace: A resource park for management, training and development. Sudbury: HSE Books; 1998. Near JP, Rice RW, Hunt RG. The relationship between work and nonwork domains: A review of empirical research. Acad Manage Rev 1980;5:415-29. Pearlin LI. Role strains and personal stress. In: Kaplan HB, editor. Psychological stress Trends in theory and research. New York: Academic Press; 1983. p. 3-32. Blair Á, Littlewood Ì. Sources of stress. J Community Nurs 1995;40:38-9. Manderino MA, Berkey N. Verbal abuse of staff nurses by physicians. J Prof Nurs 1997;13:48-55. Adib-Hajbaghery M, Khamechian M, Masoodi Alavi N. Nurses' perception of occupational stress and its influencing factors: A qualitative study. Iran J Nurs Midwifery Res 2012;17:352-9. French SE, Lenton R, Walters V, Eyles J. An empirical evaluation of an expanded nursing stress scale. J Nurs Meas 2000;8:161-78: 9183112. Mosadeghrad AM. Occupational Stress and Turnover Intention: Implications for Nursing Management. Int J Health Policy Manag 2013;1:169-76. Rahmani F, Behshid M, Zamanzadeh V, Rahmani F. Relationship between general health, occupational stress and burnout in critical care nurses of Tabriz teaching hospitals. 2010;23:54-63. Van der Ploeg E, Kleber RJ. Acute and chronic job stressors among ambulance personnel: Predictors of health symptoms. Occup Environ Med 2003;60 Suppl 1:i40-6. Al-Aameri AS. Source of job stress for nurses in public hospitals. Saudi Med J 2003;24:1183-7. Strachota E, Normandin P, O'Brien N, Clary M, Krukow B. Reasons registered nurses leave or change employment status. J Nurs Adm 2003;33:111-7.